Don’t get confuse with the title. There’s something for you to discover in this post. You’ll see. 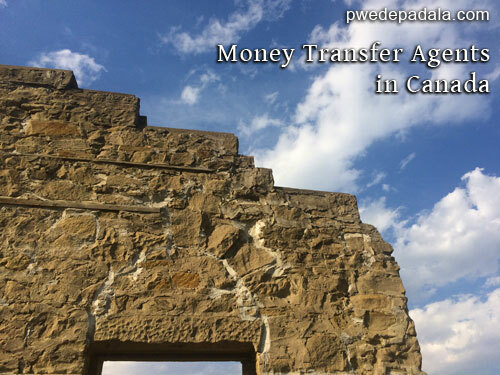 Although I emphasize that you can send money to the Philippines from Canada, the different ways that you’ll learn on how to remit money can help you in one way or another wherever you are. As an OFW myself, I’ve tried all of the three ways on how to send remittance in the Philippines from Canada. You may have tried one method for a long time. Maybe it’s time to try something else because you’ll never know if it’s a good fit if you don’t try. 1. Ask a favour from a balikbayan. “Pwede padala?” OFW doesn’t only send balikbayan boxes; we also ask a trusted relative or friend who is homeward bound to give monetary pasalubong to our loved ones in the Philippines. No fees. But when it comes to exchange rate, I’m not sure which can give a favourable return: the money transfer service in Canada or the money exchange company in the Philippines. This method comes with the highest risk. It can cost the priceless trust that is hard to establish. Add also your credibility if someone ask you the same favour. But if done right, well, you can expect to more trust, stronger relationship. And more pakisuyo in the future. You can use the web or mobile application (iOS or Android) of online money remittance company. Some of which ONLY send money from Canada to the Philippines. But majority of the companies allow OFWs to send money worldwide. The common locations of remitters are in USA, UK, Canada, Saudi Arabia, and Hong Kong. I’m biased but I have to let you know that I like to send money online to the Philippines using my mobile phone. It’s fast and easy. Remember: don’t make crucial bank transaction using public Wifi. Do it at home or use the network’s data. 3. Send money through remittance agents. Admit it. Is this your go-to method of sending money to the Philippines? It’s an old school but it works perfectly. OFWs love to go to money transfer agents which are typically located in a Filipino convenience store. Grocery and remittance can make you go beyond budget. Somehow the topic always ends about food in one way or another. That’s a Filipino trademark, eh? 4. Send money abroad through Canadian banks. I almost forgot about this post;I had to update this post so you wouldn’t miss anything. We probably have at least one account in any of the Big Five, top Canadian banks. (I have one.) So if you have a Canadian bank account, you’d be happy to know that you can send remittance worldwide. But I guess you wouldn’t be pleased with the high fee, though. That’s why I haven’t sent remittance via a Canadian bank so far, but I I’ve tried Interac for local money transfer. So far, I know of four ways on how to send money to the Philippines. The list may change or not. What I’m sure of, is that, I’ll keep updating the links particularly about online money remittance because startups keep on innovating. What else for us to do is to take advantage of it. I wouldn’t end this post without a reminder. With innovation comes greater responsibility. Become a responsible remitter and investor. Give for a reasonable cause. It’s your hard earned money so make sure it is well spent and invested. For all remittance-related content, you can click here. I’ve found blog posts that are worth reading so you can learn more about remittance. Why it costs more in Canada to send money overseas and what are the other ways to make money transfer. Share yours in the comment! PREVIOUS: With Declined Housing Loan Application, What’s Next? How about send/remit money to my BDO checking account? And let it be accessed by my aunt to use it for building my house. Also one thing, my ATM card was incidentally brought here by my mom. I’m now currently living in Alberta, Canada with my family as immigrants. I sent money online (Remitly) and through a remittance center when I had my house repair. Here’s how I did it. You wouldn’t be able to use your checking account unless you would be able to send the ATM back in the Philippines. What I did is to send the money to my parents bank account and they take care of the rest. I am trying to buy something from the Philippines but the sellers don’ have PayPal and the seller is asking for payment through BDO or any remittance centre. I think I will have to send the money by Western Union or MoneyGram. Please can you let me know how this compare to online transfer services like TransferWise? That’s also what don’t like with online stores in the Philippines. Why can’t they have PayPal when everyone is using it. Enough ranting. The difference of PayPal from TransferWise is that you can shop and send money to friends and family via PayPal. With TransferWise, you can use it to remit money online. If I’m remitting money less than $300, I prefer PayPal. More than that, I would go to remittance center although the fee range from C$ 8-12.00 but the peace of mind that comes with it is worth every dollar. I like the idea of sending money by asking a balikbayan friend. But I won’t go for it for sure. Couldn’t agree more. Also add laing and daing on the list. The most ineffective transfer method would be the banks because of the higher transfer fees. A better option would be to use remittance service providers like Transferwise, Worldremit or OFX. I personally preferred Transferwise due to their low transfer fees. Recently, tried Remitr which offered zero transfer fees for the first transaction.